How Important Are Age Equivalent Test Scores? Your child may take any number of tests as they grow and advance through school. Many are designed to gauge where they are at developmentally and at what age or grade they're learning ability lies. These tests may result in an age-equivalent or grade-equivalent test score. What does that mean and are these reliable in measuring how well your child is doing in school? This is a topic of debate in school psychology and it can certainly be confusing for parents. 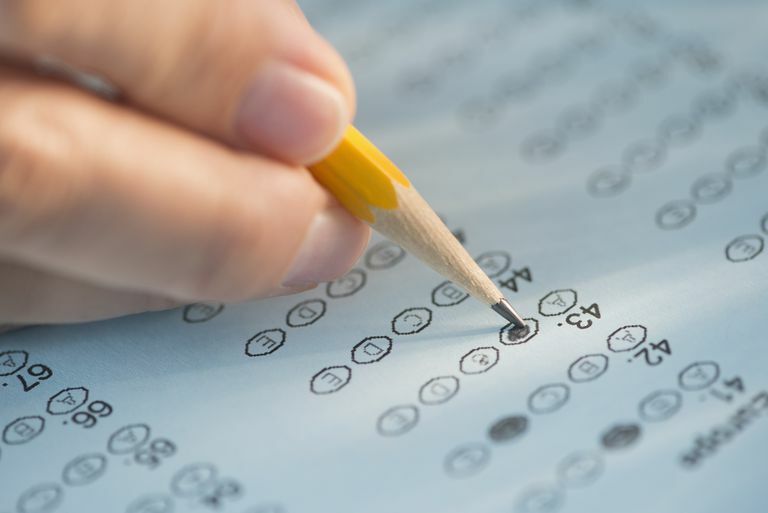 Before you rush to judgment about your child's scores—whether they're good or poor—it's important to get a better understanding of what these equivalency tests actually mean. What Do Age Equivalent Test Scores Mean? Simply put, an age equivalent is a comparison of your child's performance compared to age groups whose average scores are in the same range. For example, if your 9-year-old child scores a 42 raw score on a test, and that score is average for 8-year-olds, his age equivalent score would be 8. Age equivalent test scores are also known as mental age or test age and some are defined by grade level. However, age equivalent scores are not usually considered the most precise scores for measuring a student's performance on tests. According to the Educational Testing Service, age equivalent tests work by using samples of scores from a range of different age groups. Children with birthdays in a six-month window are grouped together to represent a certain year group. The materials on the test should range in difficulty from extremely easy to very difficult. The mean test score for each age group is found and shown on a graph. It is used to determine what the age equivalent score should be. As Paul Kline points out in the book, A Handbook of Test Construction, there is great difficulty in "establishing meaningful criterion." There are many factors that go into writing and taking tests. In order to truly interpret the results, one must take into account things like content, context, and a standard of error, as well as a child's test-taking skills on that particular day. Some parents mistakenly believe that age equivalent test scores mean that a child is more advanced (or not) than she actually is. For example, let's assume that our 9-year-old example child receives a score of 62 on the previously mentioned test. That score may be interpreted as average for 10-year-olds. This may lead her parents to think that their child can do the same work that the average 10-year- old can do. However, it's important to keep in mind that the child was not given a test for 10-year-olds but one for 9-year-olds. Doing the same as the average 10-year-old did on the test content does not mean that a child can actually handle the work required of an older child. On the other hand, if a child does poorly on the test, it doesn't necessarily mean that the child can't handle age-level work and should be relegated to material for a child one year younger. The Educational Testing Service notes that although a 6-year-old may perform on a test as well as, say, a 9-year-old, they are not the same. The former does not have the "mental equipment" of the latter, no matter the score. The same applies to grade equivalent tests, which children are given to see if they're performing on grade level. If a sixth grader performs the same as an average seventh grader on a test, it doesn't mean they can handle the seventh-grade curriculum. Educators argue that these tests should not be regarded in this manner. As a parent, it's important to keep in mind that a variety of tests can determine how well your child is performing academically. Rather than take stock in any single test, consider your child's scores on a variety of tests as well as her performance on school work. If you have concerns, be sure to speak with her teachers about ways you might be able to help. Angoff WH. Scales, Norms, and Equivalent Scores. Educational Testing Service. 1984. Kline P. A Handbook of Test Construction: Introduction of Psychometric Design. New York, NY; Routledge: 2015. Are Your Kids' Chores Appropriate for Their Age? What Do Different Types of Test Scores Mean on Standardized Tests? What Is a Test Percentile Score on Your Child's Report?